YOU MUST BE ABSOLUTELY SURE OF WHAT AND WHERE YOU ARE WRITING! Or you may completely lose all your data. Before you can physically write anything on a disk, you need to enable writing. 1 On the R‑Studio main panel, select the Tools menu, then Settings , and select Enable Write on the Settings dialog box. > The Editable: status will change to Yes from Read Only . Now the object can be edited. It is possible to manually lock an object being edited in Text/​​hexadecimal Editor . 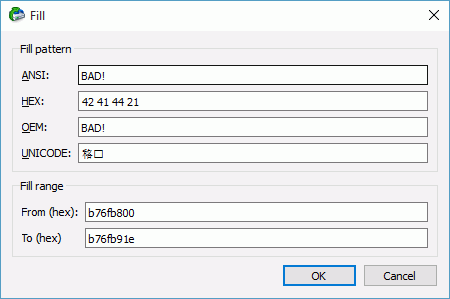 When an object is locked, Text/​​hexadecimal Editor has an exclusive access to it, and no other programs or Windows can make any changes on it. Text/​​hexadecimal Editor itself always locks the object itself before writing anything on the disk and then unlocks it. But sometimes locking/​​unlocking may take quite a lot of time, up to several seconds. That is why sometimes it is a good practice to lock an object while editing it in Text/​hexadecimal Editor . This can be done by selecting Lock on the Tools menu. • Starting from Windows 7, it is impossible to change data if it resides on a logical disk without locking the disk. If the data is on a place outside of any logical disk (on an unmounted partition or empty space), such lock is not necessary. Windows Vista, XP, or below do not have such restrictions. • The Lock command tries to lock all logical disks on which the object being edited is placed. For a hard drive, those are all its logical disks, for a file that is a logical disk where it resides. And if a RAID is created from logical disks and a file is opened on that RAID, Text/​hexadecimal Editor blocks all logical disks on which the file resides. • If a logical disk is opened in Text/​hexadecimal Editor , the Lock command locks the disk if there is no files opened by some other programs. • If a hard drive is opened in Text/​hexadecimal Editor , the Lock command locks the drive if all its logical disks can be locked. That may cause problems is one of the logical disks is a system one. Select Save Changes on the Tools menu if you want to save changes. There are up to four tabs showing the data in different representations. Actual number of tabs depends on the object and property being viewed/​edited. Exact attribute data. If the attribute is compressed, R‑Studio decompresses it prior to showing. Exact attribute data + free space of last cluster. If the attribute is compressed, R‑Studio decompresses it prior to showing. Actual data written on the disk. If the attribute is not compressed, it coincides with the Std representation. Resident part of the attribute. You may view data in 4 various code pages: ANSI/​OEM/​UNICODE/​UNICODE+ by switching on/off the respective code pages in the Code pages buttons or select the appropriate code pages on the View menu. You may see which file is written on a particular sector. See Files and Sectors for details. You may select a pattern according to which the data will be parsed and shown in the parsed data pane. The Data Interpreter shows the data selected on the Template pane in various representations. You may find the next or previous data that matches the pattern signature on the disk. Right-click the right pane of the editor and select either Find Template Signature Next or Find Template Signature Previous on the shortcut menu. You may also select these items on the Edit menu. You may also create your own patterns to parse data from various objects. Text/​hexadecimal Editor gives you various ways to navigate into an object. See the Navigating through an Object for more details. 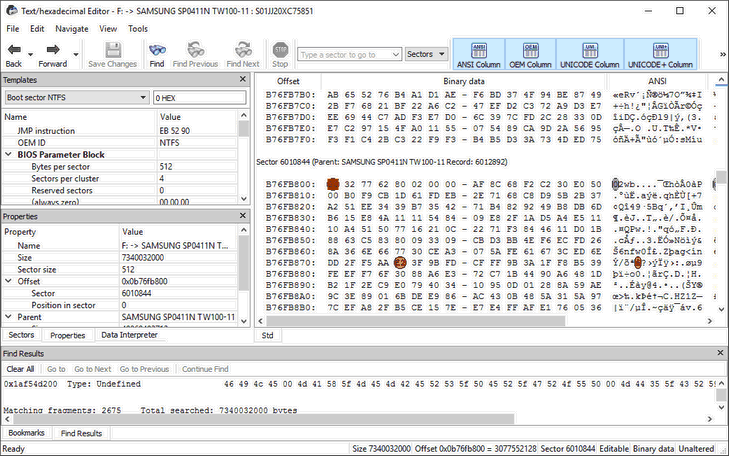 Text/​hexadecimal Editor gives you various ways to copy selected data navigate in an object. See the Data Copy for more details. To fill an area with a pattern, select Fill on the Edit menu, and specify the pattern and area on the Fill dialog box. You may select an area in the Viewer/​​Editor panel and save it as a file. • Click the start point of the area and drag the mouse cursor to its end. If you select an existing file, R‑Studio will ask you if you want to append or overwrite the file. If a remote computer is connected for Data Recovery over Network , the Save as... dialog box will appear when you select a place to save the data. You may save it to the local or remote computer. You may load a data from a file and overwrite an area of the object opened in the Viewer/​Editor panel. If a remote computer is connected for Data Recovery over Network , the Open as Binary File dialog box will appear when you select a place to open the data file from. You may open it from the local or remote computer. 2 Select the necessary file and load the data. > The area in the Viewer/​Editor will be overwritten with the new data.